Big Savings: $2.99 OPI Nail Polish at Marshalls! Ok, so I’m coming to you today with another STEAL of a beauty find. I was walking around Marshall’s with my new intern when I saw O.P.I and Essie nail polish for $2.99 & $3.99. Y’all already know OPI is like $10 a bottle lol. I don’t post about nails as much as makeup, but I am definitely a nail polish addict. My husband alway looks at me strange when I return home with another color. He clearly doesn’t see the difference between regular pink and pastel pink! *wink* I know you ladies get me tho! 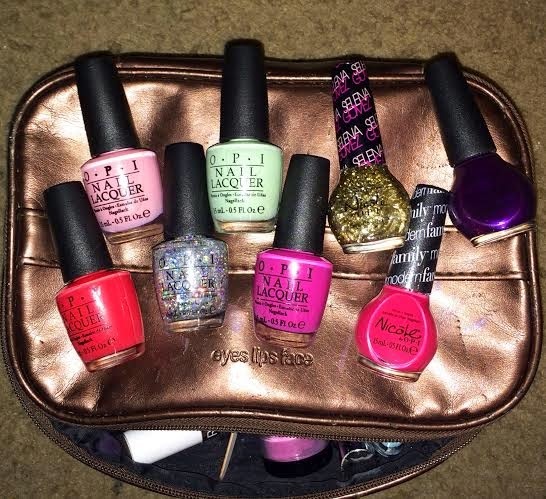 Here are the polishes I scored a few days ago. Head over to your local Marshall’s and let me know what beauty finds you’ve discovered! All the babies together now! LOL I had to get the…..you know…for this blog post! Top row: Chic from ears to tail, Gargantuan Green Grape, Opi Nicole Kissed at Midnight, Opi Nicole Make a Change. Run to Marshall’s! Hopefully they have more available!